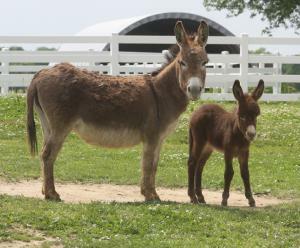 Description: We spotted this baby on the barn camera as we were heading back from Kansas Donkey Days. This was the day after the 100th running of the Indianapolis 500, so we named her after the race winner, Alexander Rossi. Love her color. Her conformation is great...nice round rear, good topline, pretty head, straight legs. She is a winner, too!